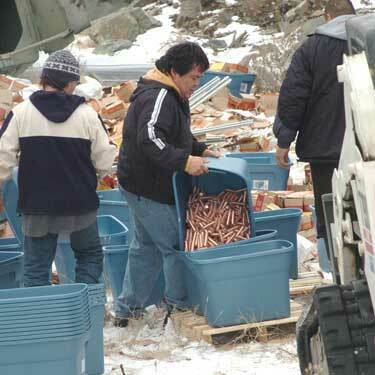 On February 7, 2008, a truck carrying commemorative coins for the Royal Canadian Mint fell 40 feet off the TransCanada Highway in British Columbia spilling it’s load. The truck was hauling “snowboarder” commemorative coins issued by the mint to promote the 2010 Olympics in Vancouver. The driver and a passenger were OK. They also managed to avoid a 1,000 foot fall into Kamloops Lake. 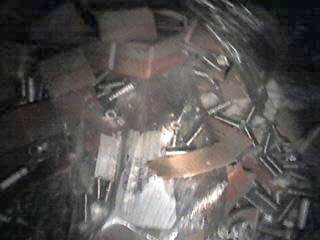 A driver that pulled up to help had to scamble up a four-foot pile of coins to get into the truck to help the driver. Technically, not a truck spill, but lava on the road is pretty cool, nonetheless. I mean, how often do you see that? 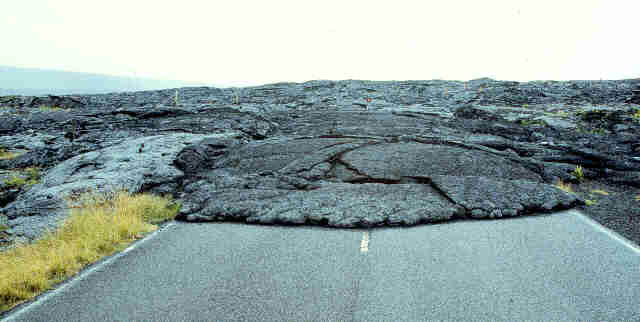 This photo shows where a flow from the Pu’u O’o lava tube system in Hawaii overspilled the Chain of Craters Road near the coast in 1995. 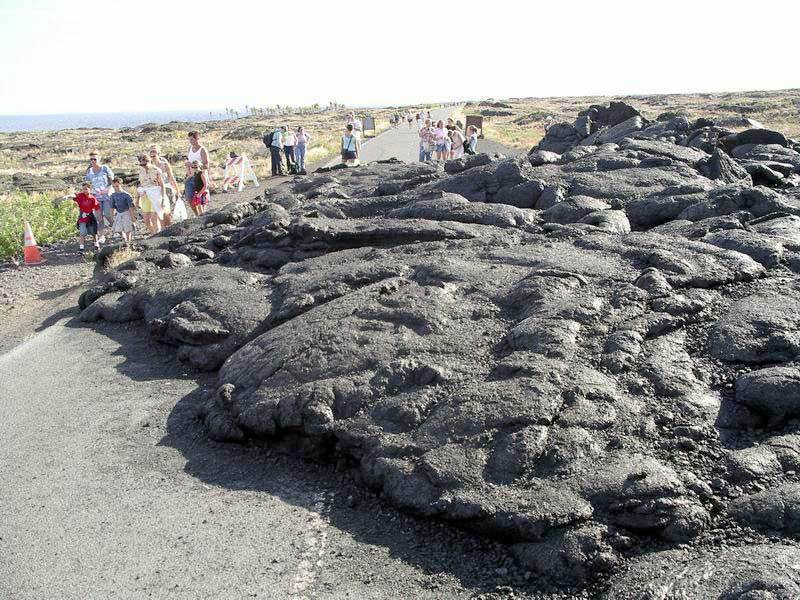 Another lava flow over the Chain of Craters road in 2004. 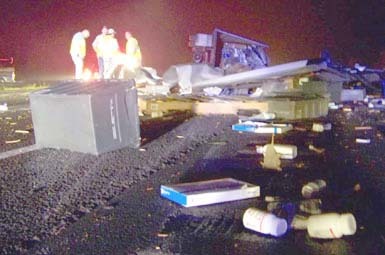 On September 10, 2008, a truck carrying prescription drugs overturned on I-40 in North Carolina. 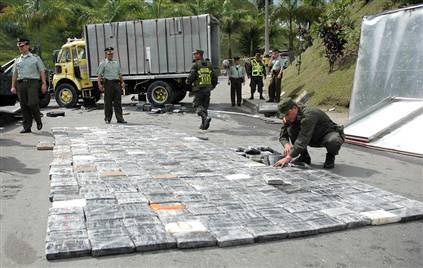 The driver was not injured, but the westbound lanes were closed for several hours while employees from the drug company cleaned up the pharmaceuticals and crews cleared the truck. The driver was charged with careless and reckless driving. 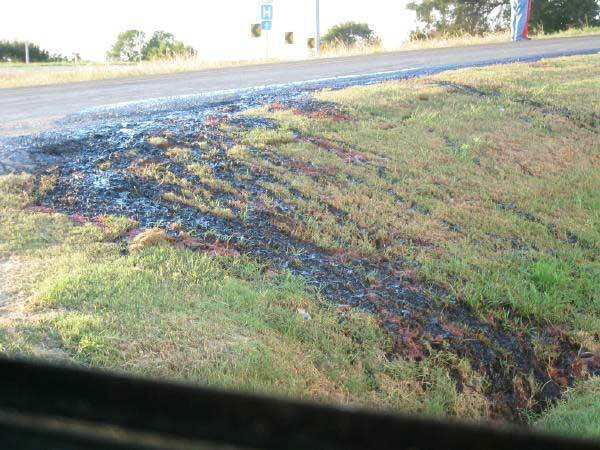 On September 30, 2003 a trailer came loose from a truck from the Dallas Crown horse processing plant in Kaufman, TX, spilling horse blood. 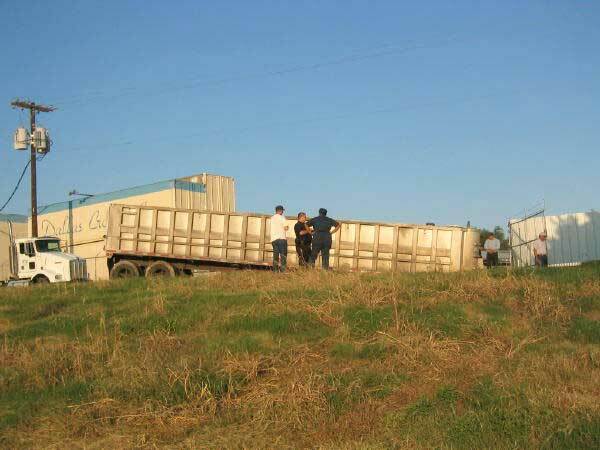 These images are from a website with information about horse slaughter. Some of the site is a bit gruesome and extreme. I was surprised to learn that in the US over 94,000 horses are slaughtered for export and an additional 20,000 are sent to Mexico and Canada for human consumption. 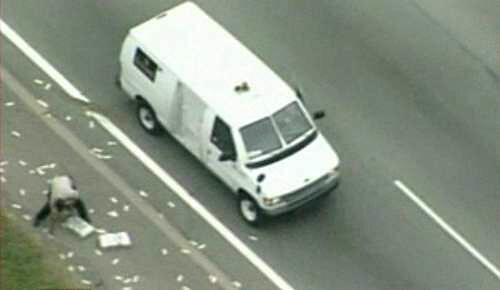 On June 11, 2009, an armored car travelling on I-75 in Detroit somehow managed to spill bags of cash onto the highway. It is not clear how their door opened and the bags fell out. 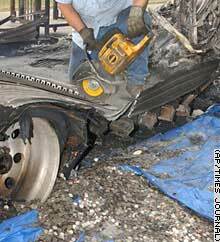 What followed is still a big problem for Loomis, the armored car company that lost the cash. Local motorists began stopping and scooping up as much cash as possible, scrambling to get the money before the guards could. Local residents who heard about the incident also began to show up in the area looking through the tall grass along the roadway for stray bills or just to heckle the guards. 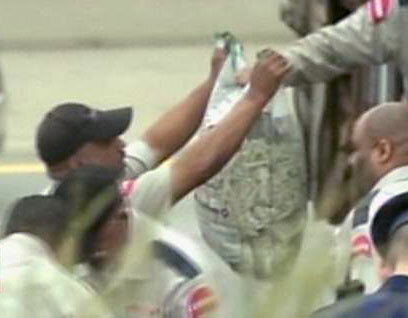 Some motorists did hand any cash they picked up to the guards. However as of Friday the company estimates that about $160,000.00 is still missing. The company claims that they will utilize traffic cameras in the area to track down and prosecute people that pocketed the money. 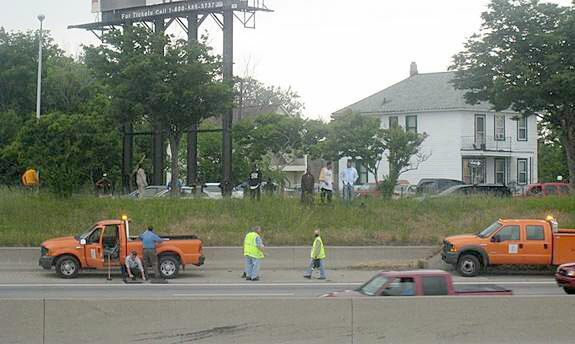 However, according to the Michigan Department of Transportation, it is illegal for them to use traffic cameras in order to apprehend anyone. So there seems to be little they can do to find those that walked off with cash in their pockets.